In our world of 7 billion, 1.4 billion people are living on less than $1.25 a day. 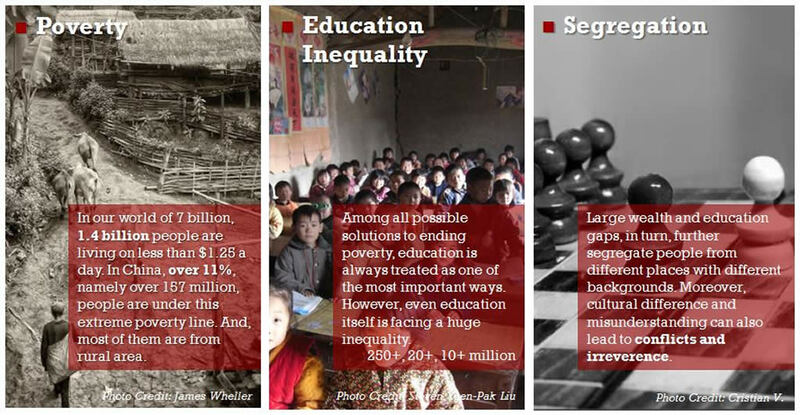 In China, over 11%, namely over 157 million, people are under this extreme poverty line. And, most of them are from rural area. Education is always treated as one of the most important ways to ending poverty. However, even education itself is facing a huge inequality. There are over 250 million migrant workers in mainland China, and thus over 20 million migrant children living in cities with limited education support while another 10+ million kids left in remote hometown with inadequate education resources. Even in cities, the education opportunities have been never fairly distributed due to the large wealth discrepancy. No need to mention the ineffectiveness of spoon-feed education system. Large wealth and education gaps, in turn, further segregate people from different places with different backgrounds. Moreover, cultural difference and misunderstanding also lead to a lot of conflicts and irreverence. Indeed, there is no silver bullet. We are not trying to solve all those twined problems once for all. Instead, we are exploring possibilities, the possibilities to alleviate those puzzles. We are just doing what we can, and trying to do it better. Here is our solution and mission.